Have you found yourself wanting to go for a walk with your grandchildren but not being able to because of bone pain? As time takes its toll on your bones, and you feel as if your bones work against you and no longer for you, you start to miss out on precious occasions in life. We want to help you enjoy every moment. In this post, you will discover natural solutions for strong bones that can help you make peace with your body and enjoy every movement in life with a big smile on your face and a youthful bounce in your step. Strong bones allow us to stay active and provide structure to the body. Bones also protect the internal organs and anchor the muscles. Healthy bones are required for good posture, balance, strength, and overall attractiveness. To enjoy strong bones, key nutrients are required, such as Calcium, Magnesium, and Vitamin D.
There are plenty of safe, effective things we can do to protect and strengthen our bones. Some medical experts recommend diet, exercise, and nutritional supplements to avoid undergoing the consequences of prescription drugs. Regular, weight-bearing exercise is a signal to the body to deposit minerals in the bones, especially in the hips, spine, and legs, where the minerals can be used to fortify the bones. When it comes to building strong bones, what you drink matters. Drinking fresh, filtered, pure water is a vital element in our lifestyle. You are correct, Watson, milk does contain calcium, but it unless you are a newborn calf, this calcium is not in a form that can be easily absorbed by our bodies. Nor is milk a healthy beverage if it comes from factory-farm cows treated with antibiotics and growth hormones. Part of enjoying every movement in life implies not only savoring all the food in your fridge but enjoying the nutritional values of food. How so? There is one category of food that quite possibly is the best for strengthening bones: leafy greens. Simply add several servings of leafy greens and calcium-rich veggies (like broccoli and kale) to your daily diet. A balanced intake of seafood is also a good source of calcium, especially salmon, sardines, and shellfish like clams, oysters, and shrimp. Magnesium: Some people tend to have low levels of magnesium, and this contributes to osteoporosis, as well as high rates of cardiovascular problems, which magnesium may also improve. Seafood and meat are good sources of magnesium, along with brown rice, leafy greens, and whole grains. Vitamin D: This wonderful vitamin promotes the absorption of calcium. If you have a vitamin D deficiency particularly in your older years, it can lead to osteoporosis or osteomalacia (bone softening). Because we care and because we want to help you into the transition towards an ongoing healthy lifestyle. We have the perfect treat for you. 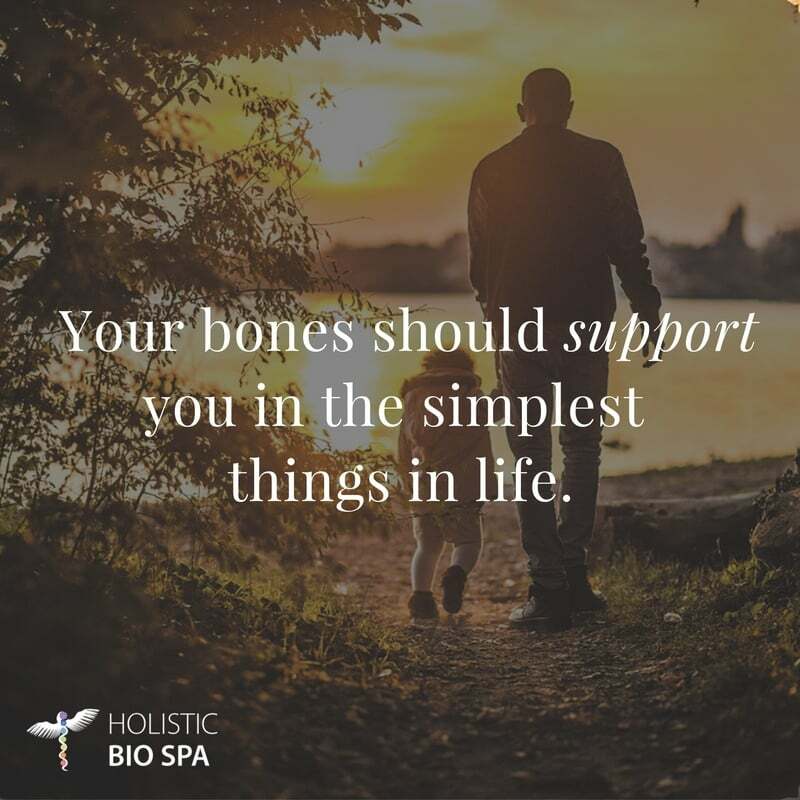 Our bodies are constantly working hard to build new bone material, and we can help out with some moderate exercise, smart food choices, and a great natural supplement. 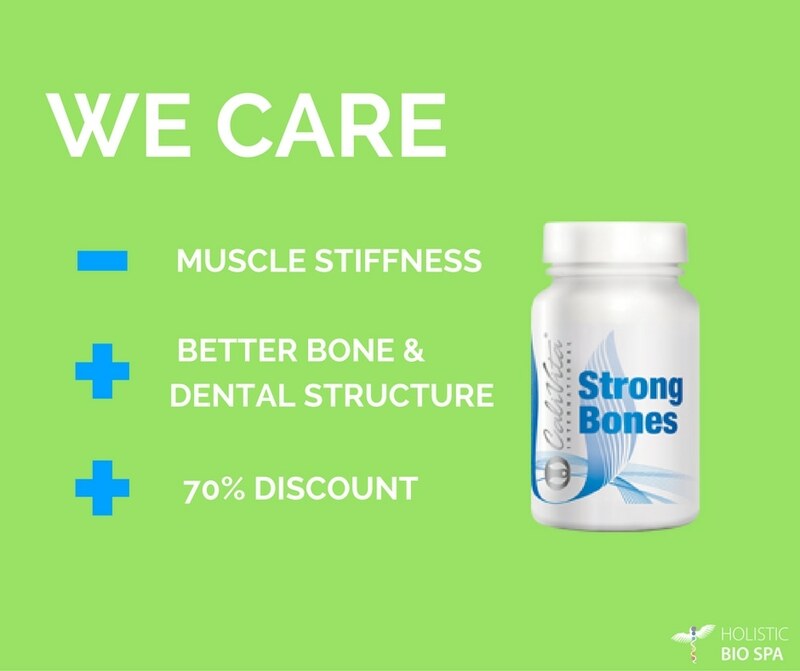 Strong Bones is the supplement that takes you out of the storm into a calm and firm state. With the recommended daily dose, your bones will always have the materials they need to support you and your years ahead will be marked by a strong frame and a youthful bounce in your step. And you can get it at a discounted price, only $100 MXN instead of $350 MXN. Give our amazing team a call at +52 (322) 221 1607 and we will do our best to put one aside for you so you have enough time to pick it up and pay. They’re going fast!